US, 1957, 107 minutes, Black and White. Jose Ferrer, Kim Hunter, Kurt Kasznar. 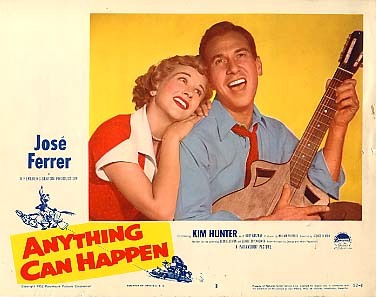 Anything Can Happen is a simple film with warmth and pleasant charm. Its concern is the migrant, his problems and his feelings. It touches on most of the problems of migrants which are worth discussing. Jose Ferrer is excellent as a fine migrant from Georgia (U.S.S.R.) and direction is by George Seaton (more recently of Airport fame). 1. The problems of migrants, separation from homeland, family and friends, loneliness, language barriers, search for jobs, lack of familiarity with a country's customs and laws, feeling foolish or less than adult because of being unable to act and communicate as an adult. 2. The honesty of the hero, principled and direct; the appeal of plain simplicity ? e.g., the court scene. 3. The true nature of friendliness and friendship, shared interests e.g., folksongs, the ordinary things of life, cooking, meals. 4. The value of community of effort in a group of migrants from the one country who try to settle into their new country but have only one another to ask for help. 5. The place of genuine ambitions in life and the nature of true love as a basis of unspectacular, but real. happiness.